They’ve gone head-to-head on the field, and now the Atlantic Coast Conference’s best entrepreneurs battle it out Shark Tank-style. 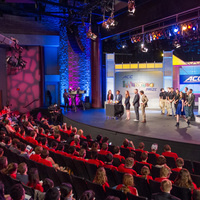 Each university has set out to find their very best students to compete against other ACC schools in the fourth annual ACC InVenture Prize innovation competition. Please join us on April 17 to see which ACC university comes out on top. Doors open at 7 p.m. Please plan to be seated by 7:30 for this exciting live broadcast event. Register online and let us know you are coming.